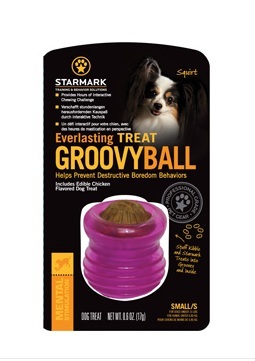 The Starmark Everlasting Groovy Ball has an outer casing made from a virtually indestructible material that is stronger than rubber and free of latex, vinyl and phthalates, so great for even the most powerful chewers. Inside is an edible dental chew which encourages play and improves oral hygiene. The Groovy Ball also has exterior grooves which can be stuffed with your dog's favourite food or treats. Each Groovy Ball comes complete with an edible chicken flavoured treat. There are currently no questions for Starmark Everlasting Groovy Ball Dog Toy - be the first to ask one!